Ahoy there mateys! Do ye know wha' today is lads an' lasses? 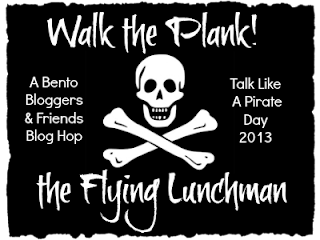 It's talk like a pirate day! Me sent this here lunch t'school with me wee scallywag. Me hopes she has a jolly roger good time at lunch. 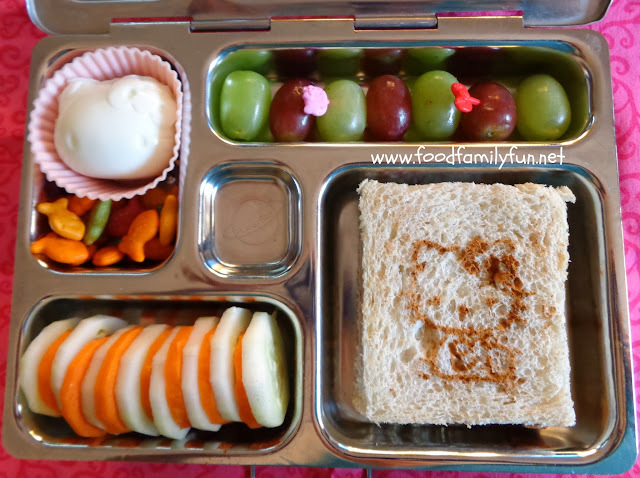 Rose's vegetarian lunch includes a boiled egg shaped like a fish, some goldfish crackers, red and green grapes and yogurt covered raisins for a sweet treat. I also packed carrot sticks and grape tomatoes. I made her cheese sandwich in the shape of a pirate! I didn't have any pirate themed cutters and I felt like I needed a little inspiration so I thought back to my Funky Lunch workshop. I used a circle cutter to cut the sandwich, and used red pepper for the bandanna, orange pepper for the nose, cheese and raisin for the eyes, fruit leather for the smile and earring. The eye patch was cut out of Nori with a pair of kitchen scissors. 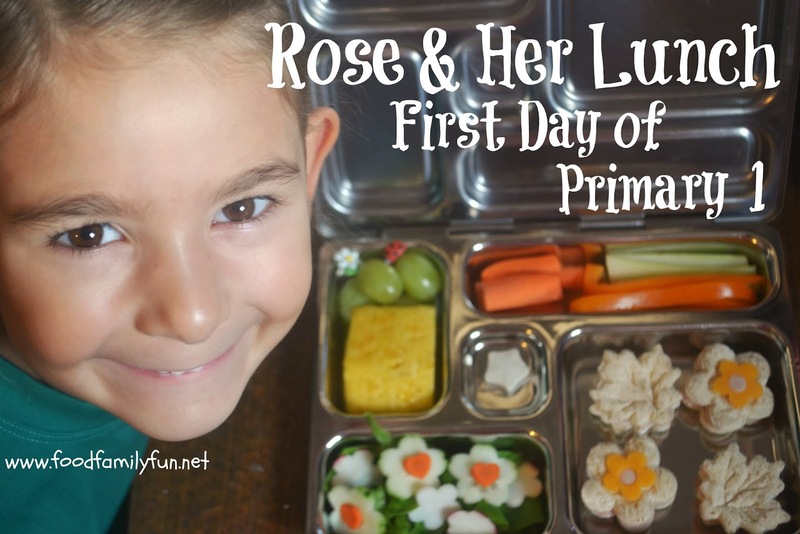 Rose was so happy to see her lunch in the morning that she wanted a photo with her lunch. She also decided to take that pink bandanna for her cloth napkin! This lunch is part of a blog hop. 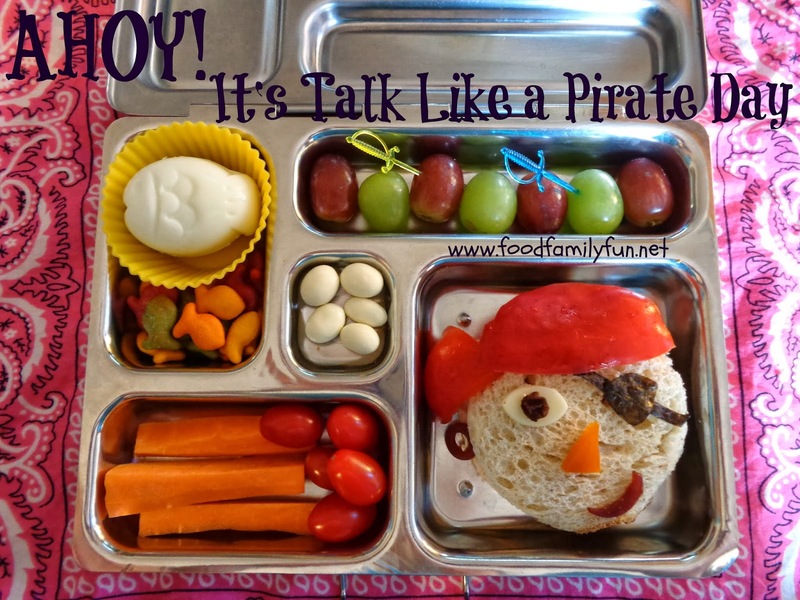 Please click the button below to see the fabulous Pirate lunch that Rebecca from Bentos on the Bayou made. After ye've sailed 'round this hop, hang on to yer sea legs! Click 'ere to board t'next ship fer another hop! Hello Kitty Fun lunch! I made this fun lunch with Hello Kitty and some patterns for Amy. Amy has a Hello Kitty shaped boiled egg, some goldfish crackers, cucumber and carrot slices, red & green grapes. Her turkey sandwich was easily decorated using a Hello Kitty stencil and some cinnamon. These are really all of her favourite things so it was no surprise that she ate almost everything. Sweet little Rose asked for salad only for her lunch on Friday. I packed her half a sandwich also. Flower stamped cheese sandwiches made with the ultra thin Sargento cheddar slices. This is the equivalent of half a sandwich and the ultra thin cheese is contributing minimal protein so I added some cheese sticks/cubes that I cut from a larger block of Irish cheddar. Rose also has yellow bell pepper strips and watermelon pieces. 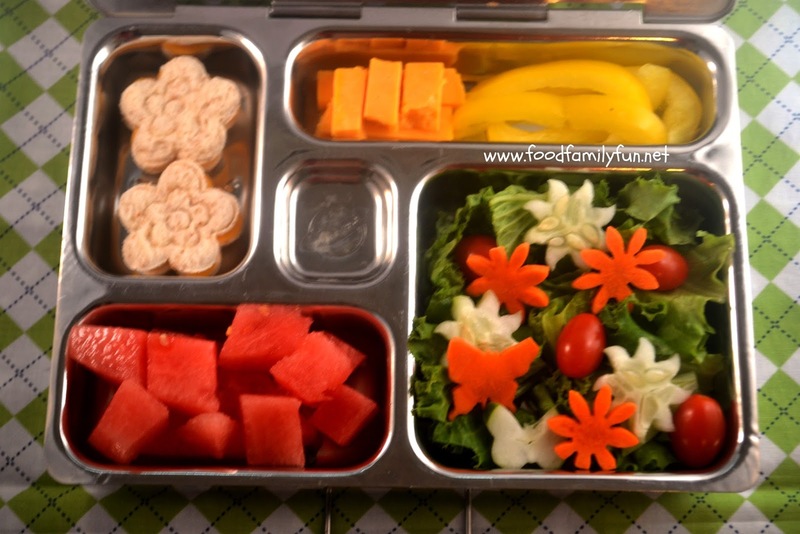 The salad that she requested is made up of green leafy lettuce, grape tomatoes, cucumber and carrot shapes. She ate almost everything leaving a few pieces of lettuce and carrots that the guinea pigs were happy to receive! The picture is fuzzy because of my broken camera :( boo. I love all of the paper backgrounds that other lunch bloggers use when taking photos. I mostly have a bunch of Christmas colour scrapbook paper so I have been using something new for the past few days. Our Funkins napkins! They have reversible patterns. 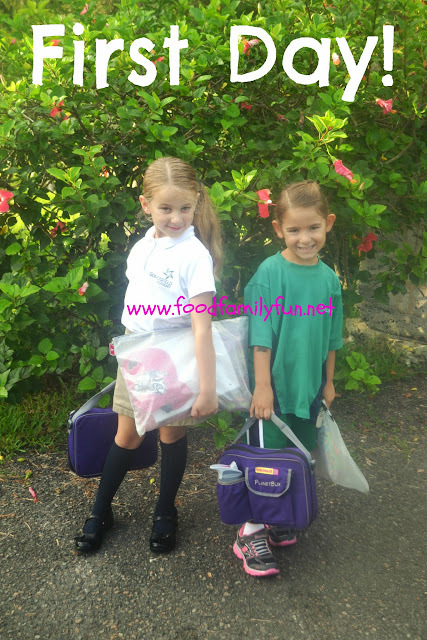 The girls love taking them to school in their lunch bags and I love the backgrounds in my photos. Fancy Sandwich Friday on beneficial bento is back! I wanted to link two lunches this week so I made two separate posts. 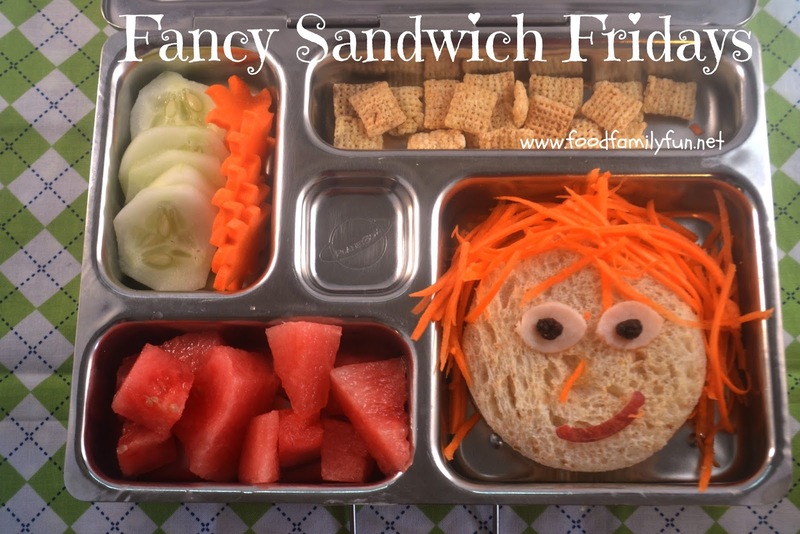 Click the button at the bottom of the post to jump on over and see some other Fancy Sandwich lunches. 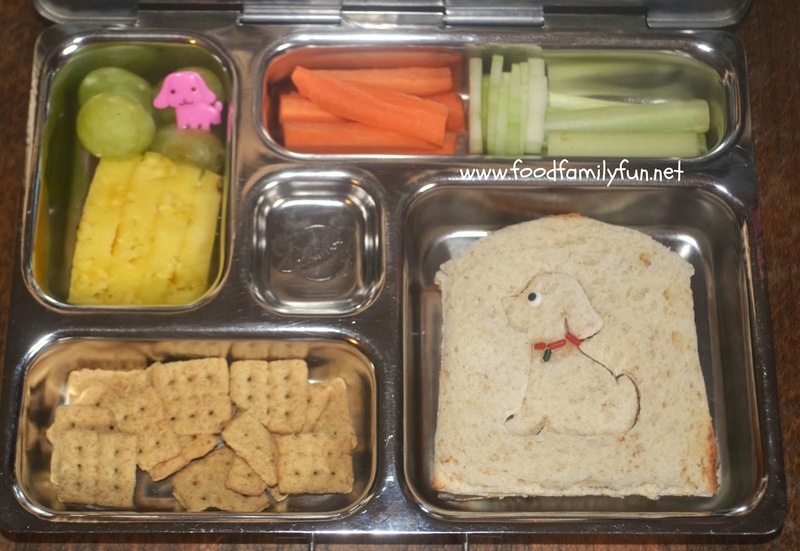 Here's Amy's fancy sandwich lunch. Amy has cucumbers and carrots, rice Chex, watermelon pieces and a turkey sandwich with wild carrot hair. The features are made from turkey, raisins, and apple peel. She had an apple for snack today and I peeled and sliced it this morning. The rest of the apple peel went to the guinea pigs :) She didn't eat most of the carrot hair though or the turkey eyes. I think she automatically thought the eyeballs were made from cheese! Silly girl. 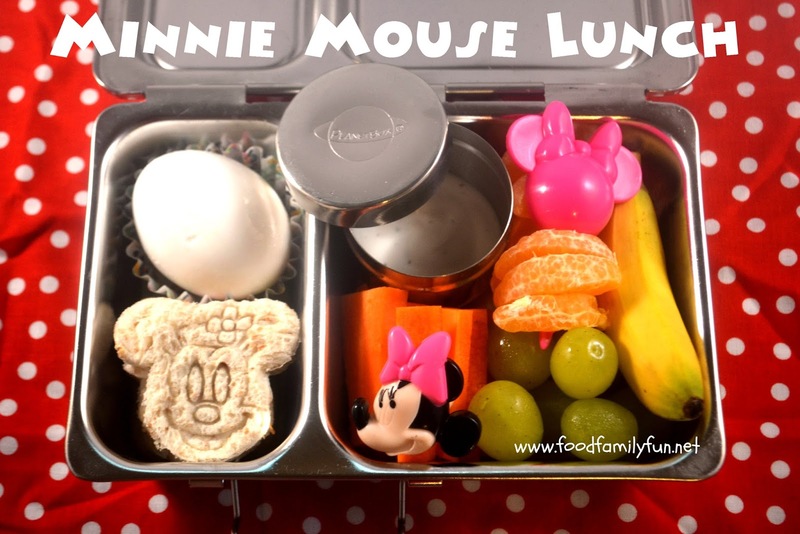 Today I made a fun Minnie Mouse themed lunch for Heidi. Heidi has a boiled egg, 2 Minnie Mouse jam sandwiches (equal to half a sandwich), carrot sticks and ranch dip, a segmented clementine, a handful of green grapes and the cutest little banana that I ever saw! My Mom dropped off a small bunch of these cute little bananas. She said she thought they would be the perfect size for lunch and they were. I made a small cut near the top to make it easy for her to peel. After yesterday's, " I didn't eat those vegetables because they were touching the alfalfa sprouts" incident I decided to go back to a really simple, no new items lunch for my picky eater today. Amy has cucumbers, celery and carrot sticks in the top left compartment. You can't easily see the celery as it's under the carrots. Watermelon pieces and green grapes are in the bottom left. 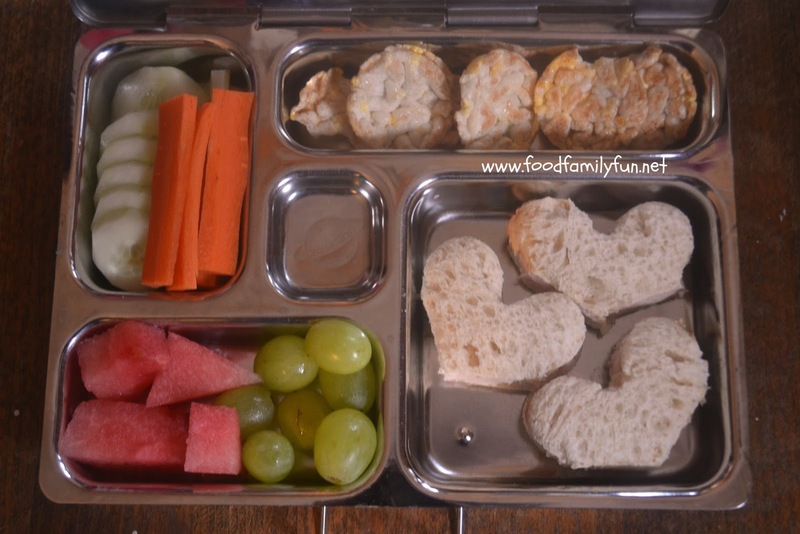 Apple Cinnamon popped rice cakes in the top compartment and 3 heart shaped honey roasted turkey sandwiches in the main compartment. 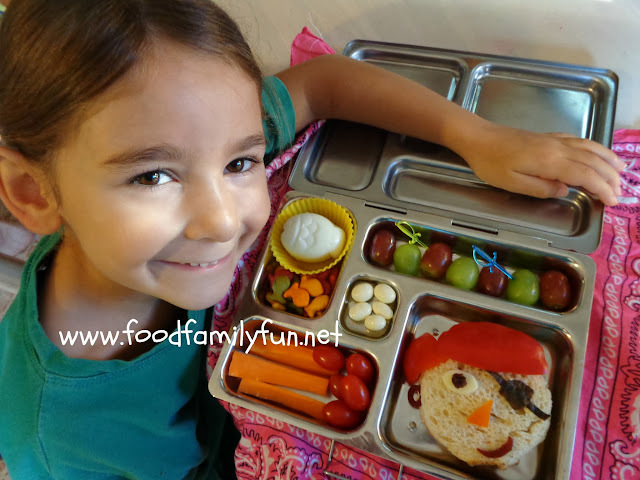 She likes absolutely everything in this lunch box so hopefully it will be a happier lunch time today. For her snack today I packed a sliced pear (not shown). Today was Heidi's first day back to school This year she is a Full Day student which is the age of Pre-K in the USA. She's returning to her old classroom in the Children's House with her same teachers but will not leave before lunch this year. There will also be some new students joining the class as older students have moved on up to another class. 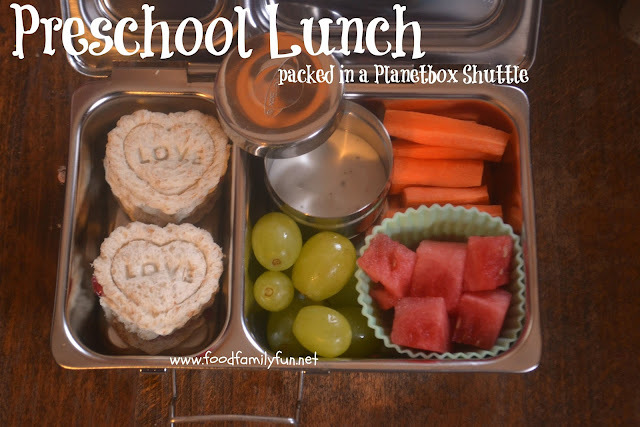 Heidi's first day of school lunch was packed in our Planetbox Shuttle. It seems like a great size for her and it fits in her favourite character lunch carry bag. Can you guess which one that might be? DORA! For lunch, Heidi has 4 mini heart jam sandwiches (stacked), carrots and ranch dip, green grapes and watermelon. This might seem like a low-ish protein lunch (there's about 7-8 grams) and normally I would have made those PB & J sandwiches. This year a note came home and said no peanut butter in snacks due to an allergy. I think that should include lunch too but I am not positive so I left out all nuts until I can confirm. I didn't really plan that out too well as I could have added something else in it's place - you know like a piece of cheese, or the boiled egg in the fridge. I was thrown by her request for a sandwich this morning as I had planned to pack her some mini quiches like her sister. Maybe she ate too many last night! Heidi is really not much of a meat eater which is fine with me. I'll do better tomorrow. I can't wait to hear all about her first day! One of the other class moms organised a playdate at school right at the end of summer. That worked out perfectly as she got to see her teachers again, see some old friends and meet some new friends that will be joining the class. That was sure to make the first day back an easy one. 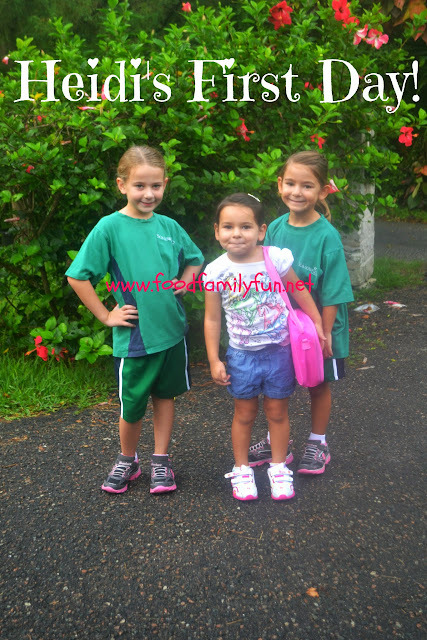 Here she is all set for school - posing with her sisters, carrying her Dora bag and wearing her Dora sneakers! Here are two items that I used when making this lunch. Today, Rose has a recipe straight off the Momables menu, Ham & Cheese Mini Quiches. 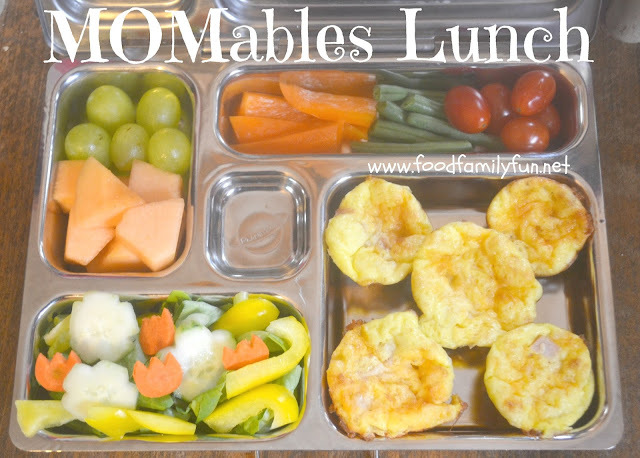 Momables is a lunch menu planning service. You can sign up to receive a weekly menu of 5 lunch recipes with photos, tips & shopping list. Each recipe gives you a hint to make it gluten free or vegetarian if applicable. 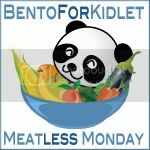 When you sign up you also gain access to other Momables recipes and their homemade resource guides which are not available on the public website. Rose has green grapes, cantaloupe, a green salad with baby butter lettuce, cucumbers, carrots and yellow pepper. 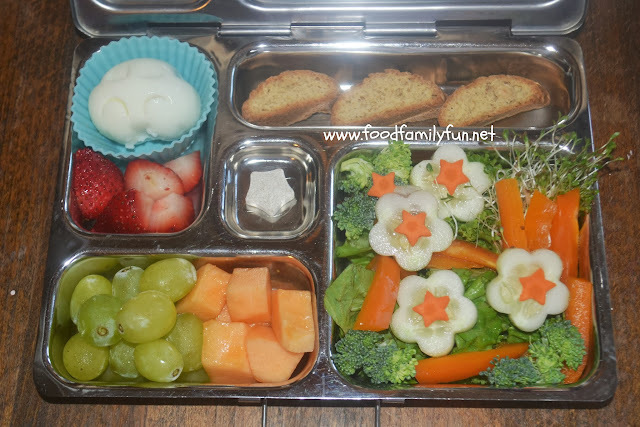 The top compartment has orange pepper, green beans and grape tomatoes. In the main compartment there are 5 mini quiches. The original recipe calls for ham but we substituted honey roasted turkey since that's what was on hand. This recipe literally took 20 minutes tops to whip up last night. I popped them in the fridge and packed them for lunch this morning. They were cooling on the rack for a bit after baking and at one point I thought I would have to stash a few away to make sure there would be some left for lunch. Turns out they are a quick and yummy snack too and everyone in the house gave them the kid seal of approval! If you want to sign up click the button below! You can also signup for their newsletter (recommended!) and gain access to a free sample menu. Today is the first day of school for two of my girls. There is a staggered entry into school so Heidi will not go back until Thursday. Today, Amy started Primary 3 (like US Grade 2) & Rose started Primary 1 (like US Kindergarten). Heidi will be a Full Day in the Children's House at school which is like US Pre-K. New this year - Emily is starting a playgroup a few mornings a week. She starts next week. Here they are all ready for school. Rose has gym today so she starts in her gym uniform and Amy starts in their regular uniform. Lunch is packed in their Planetbox Rover lunchboxes today. 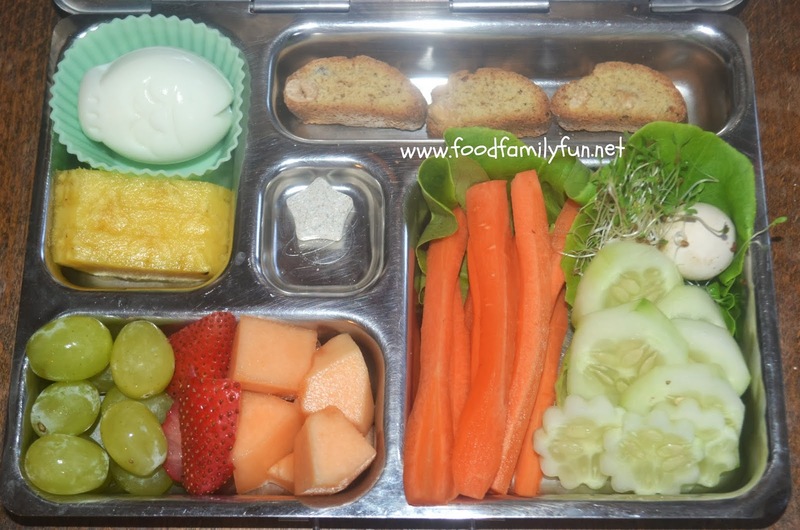 Rose's lunch; she's trying a little salad in her lunch for the first time! 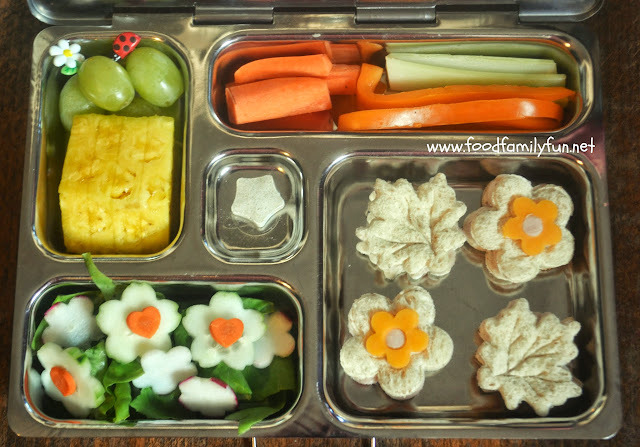 grapes, sliced pineapple, salad with butter lettuce, radishes, cucumber & carrots, carrot sticks, orange pepper, celery, Rainbow Light kids one vitamin, turkey sandwich with cheddar topper. I am going to make an effort to pack fewer sandwiches this school year, but I wanted to start the first day off with something familiar, I'll start to try new things slowly. Next week, I am away for work so Daddy will be packing all of the lunches. I hope he takes a photo! Rose was so happy to see her lunch she wanted me to take a photo of her with her lunch!